Perched up above Fountain City, we are surrounded by 360 degrees of privacy with breath-taking views of the Smoky Mountains. Our property is located on 6.5 acres in the heart of historic Fountain City, just minutes from downtown Knoxville. Our cozy and quaint guesthouse has 2 bedrooms that each sleep 2 guests and 1 small bath with a kitchen and living room. We have a queen-size aerobed that sleeps an additional 2 guests and a pack-n-play or toddler cots available if needed. Pre-approved pets are welcome (pet fee applies)Guests are welcome to share the outside common areas including the tennis court, basketball goal, picnic area with fire pit and grill, as well as the Both the patio and covered porch on the main house. Children are welcome to play on the playground. Toddler cots/pack-n-play/highchair/stroller available upon request. I am a wife to a wonderful husband, and a mother to 2 beautiful children that keep me on my toes every moment of the day! We work hard so we can play hard! We are an easy-going family and enjoy the simple things in life, like going to the lake, or playing outside in the yard. We love wine, cooking, football (Go VOLS!!!) and entertaining with/for our family and friends. We found our "forever" home in beautiful, historic Fountain City (Knoxville) and we are living happily ever after! Our "forever home" came with a guest house and we are excited to share it with our old and new family and friends! We absolutely fell in love with this property the second we laid eyes on it and have no doubt that you will too! Built in 1929, this property is overflowing with beauty, charm and character. Come visit us, you wont be disappointed. Our pictures do not do it justice! The bathroom is small and unfortunately not wheelchair accessible. If you have limited or restricted mobility, please dont hesitate to ask if the space is right for you. Your comfort is our number one priority. The fireplace is for decoration purposes only. It is not safe to use. Cooking oil, salt and pepper provided. We also provide an assortment of snacks and light breakfast items including oatmeal, grits and breakfast bars. Full-sized fridge and stove/oven available for your use during your stay. The kitchen is stocked with dishes, pots and pans and utensils for your convenience. There is also a coffee maker and toaster. We do not have a formal eat-in area inside the cottage, however, we do have 4 TV trays for tour convenience. We also have a picnic table outside for your enjoyment. ~7 acres of land for your to roam at your leisure. Property has private tennis court. Feel free to use our tennis rackets and tennis balls or shoot some hoops on the basketball net. Clean, well stocked cottage in historic Knoxville neighborhood. The cottage was on a beautiful property in a quiet neighborhood. Jackie was wonderful, checking to make sure we had everything we needed. We would definitely stay again if we are in the Knoxville area. It's a great location and easy to get to downtown. The Walnut Grove Guest Cottage was the perfect location for our trip the Knoxville area. All the comforts of home in the adorable stone cottage and very accommodating of our senior dog travelling with us. The owner was quick to answer any question. We will definitely be back! Great location to get anywhere conveniently but quiet place to stay! We had a great time! Overall, this was a fantastic quaint place to stay! Jackie and Matt were very accommodating and thought of everything! The house has been recently remodeled and is very nice and comfortable. The bathroom is small but you don't spend a lot of time in there so it is adequate. The setting is nice and quiet. It feels like you are out in the country yet you have a very good selection of restaurants and shopping five minutes away. I would stay there again if I were back in the area. My sister's and I stayed at this lovely cottage and had a great time. 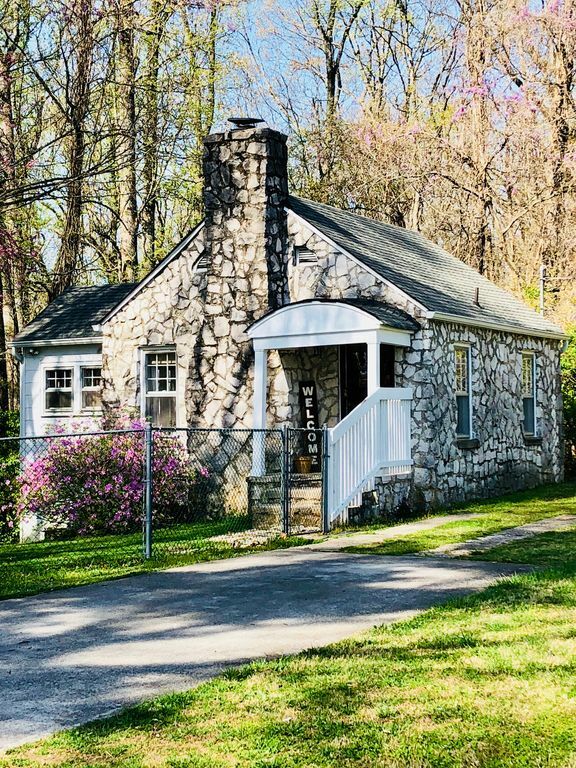 The cottage gives you the experience of being away from the hustle and bustle of the city but it's only 10-15 minutes from downtown Knoxville. The cottage has all the basic essentials such as coffee, cream, sugar, sodas and snacks. The cottage is pet friendly which made the weekend getaway even better since I had my furry babies with me too. Pets must be pre-approved with host prior to making reservation (pet fee applies); SMOKING IS PROHIBITED! NO SMOKING INSIDE! NO SMOKING OUTSIDE! Check- in is after 3:00 PM and Check-out is by 10:00 AM unless otherwise specified Rental rate includes 2 guests. Additional over-night guests are an additional $15 per guest per night. Please be sure your reservation correctly reflects the number of guests for an accurate quote. The city of Knoxville now requires the collection of sales and lodging taxes.Taxes may not have been included at the time of the reservation and may be collected by the host at a later time.